Kate Middleton and Prince William's wedding last year surely went down in the books as one of the most over-the-top parties in London's recent history, and this weekend another royal event made a splash. Literally. Over a thousand boats gathered on the River Thames Saturday to help celebrate the Queen's Diamond Jubilee, officially breaking the Guinness World Records title for the largest parade of boats. It's estimated that one million people lined the river to watch the flotilla. 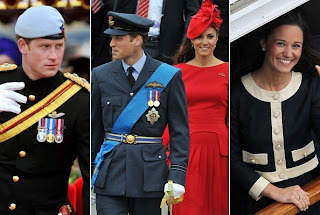 On the biggest boat of all, the Spirit of Chartwell (the official royal barge), were Will and Kate, Prince Harry, Prince Charles, along with the guest of honor and her husband, Prince Philip. The 210-foot vessel was covered in over 10,000 flowers, which held up surprisingly well given the poor weather conditions. fascinator. The boys were in their military dress uniforms and the Queen wore an elaborate white dress with matching coat and hat. "Kate was saying 'hi,' 'hello' to everyone she saw and was smiling ear-to-ear despite the bad weather," an unnamed insider told Us Weekly. "William walked a step or two in front of her the whole time. She looked gorgeous in red - really slim and healthy looking." On another vessel was the rest of Kate's family. 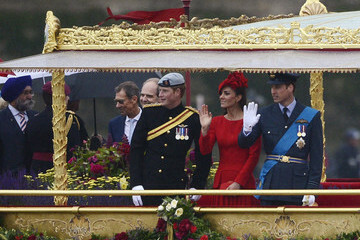 Her mother and father, sister Pippa and brother James waved to the crowds from the Elizabethan steamer boat. The celebrations honor the Queen's 60-year reign. She is only the second British monarch to reach a Diamond Jubilee.